Over time I have come to consider myself a Destin expert. Well, maybe an almost expert. I have been going to Florida for as long as I can remember. Now to clarify, when I say Florida, I am referring to Destin. When I am down there I stay in Sandestin. This is due to the fact that my aunt owns a condo there. As much as I consider myself an expert, I never have figured out whether Sandestin is in the city of Destin, or whether it is it's own city. I mean it is big enough. For example, street 1 and 2 would make up bayou villas, and streets 3,4,5, and 6 would make up Tivoli. Confused? Click Here to see a map. But the biggest divider you will notice right away is highway US 98. Well, the resort is divided in half by highway 98. On the north side of the highway are Linkside and Dockside (these two divisions are often refered to collectively as Bayside), and on the south side of the highway is Beachside. Once again, if you don't understand Click Here to see a map. you get the idea. They also have a pretty good bar. Also if you are looking to sun tan, this pool is probably the best. The only reason I make this statement is because there is more deck space which means more deck chairs. If you are looking to sit and drink by the pool I would recommend the bayside pool. Their bar is much more lively and quite a bit larger. Also you don't have to sit in a deck chair, because they also have tables. And if you get hungry, the bar serves light food, and the general store is right in front of the pool. You can read more about the general store in the shopping section. If what you are looking for is a quiet, plain, pool then the "Owners" pool is for you. There is nothing special about it. No food, no bar, and not many chairs, but it isn't as crowded. and if you don't feel like getting out then they will deliver a pizza to your room. This is the place to be if there are sports on tv. But if there is a game you want to watch on the big screen then I recommend getting there early, because the big screen is a first come first serve system. There are also darts, pool, and 2 video games. The other two restaurants in the resort are expensive. First is the Elephant Walk. This resteraunt has been there for a long time. They serve fancy food. I cant tell a lot about it because I have never been. All I know is that it is suppost to be very good and it has a very good view of the beach. The last restaurant in Sandestin is Seagars, and no, that isn't a typo. As you may have figured out, it's specialty is cigars. I have no clue what type of food they serve or if it is good or not. But that's it for restaurants. Biking is quite possibly the best thing to do in Sandestin. Plain and simple. I say this for two reasons. 1) It is FREE. 2) you can go anywhere and see everything. There are two bike centers where you can get your free bike. One on bayside near the Sunset Bay Café, and the other is Beachside, near the shuffleboard, basketball, and the Put-Put. There is either a bike path or a sidewalk everywhere in Sandestin, so the possibilities are endless. I am not a big participant in these activities but I have had some experience. Some of the watersports are, sailing, kayaking, and wave runners. The sport that I have participated in is sailing. In fact when I was there I took sailing classes. You can do that, or rent a sail boat. You can do all of this at the marina. You can also do watersports at the beach. At the beach you can rent sailboats, wave runners, kayaks, rafts, and other stuff. Put-Put is Put-Put. There is nothing special about this course. It isn't real exciting. Well, not exciting enough to pay the price for. ), and candy and snacks. The Westwinds tower also has a little general store in it. On the other side of The Pub is a Pro Shop, but I have never been in there. There is also a shop at the marina. They sell snacks, shirts, maps, bait, and stuff like that. Other than that there isn't really anything else. .very nice it is on the beach. 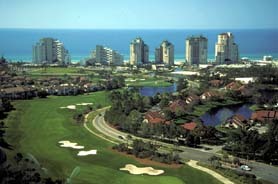 For more info on the hotels you can call Sandestin Reservations at 1-800-622-1922 or 1-850-267-8150. You can also call Sandestin Information at 1-850-267-8000. These things are an amazing feat. Not including the Hilton, there are 6 high-rises already built, and another one being built. These are: Beachside I & II, Southwinds I, II, & III, and Westwinds. Westwinds is the newest of the three. You can read about good uses for these highrises in the "tips, tricks, and secrets" section. We will start with the oldest towers, the Beachside Towers. These towers were built in 1984. Each tower is 20 stories tall and has 200 Rooms. The rooms range in price from $90.00-$481.50. Next are the Southwinds towers. There are three of them. They were built in 1998. Each tower is 23 stories tall and has 75 rooms. these rooms range in price from $250.00-$266.00. There is only one small problem. These rooms can only be book for one month stays. So unless you want to stay for a month, you might want to think about another place. Last but not least is Westwinds. This tower was also built in 1998. It is 23 stories tall and has 95 rooms. These rooms range in price from $265.00-$504.00. Well that's it. Incase you were wondering. The reason I didn't do a Condo section, is because if I had to tell about all of the different sections in the resort I would never finish. But if you have a question about one of the sections or condos just e-mail me and I would be happy to respond to you. Well in case you haven't already figured it out, the beach is the main attraction. The beaches at sandestin are clean and neat. You can rent deck chairs and umbrellas or you can take your own. At certain times of the year you can rent water craft such as the water bikes, kayaks, canoes, and sailboats. There are two main local news papers available in Destin. They are the Walton Log and the Destin Log. As far as news goes they will both tell you pretty much the same thing, but if you are looking for movie times ask the person you are buying it from and he or she will be able to help you. Shopping is one thing there is no shortage of in Destin. The shopping that is closest to Sandestin is the market. This has many different kinds of shops. It has a toy store, a kitchen shop, a Christmas shop, a tuxedo shop, a candy store, and much much more! The other big shopping is at Silversands. This is just right down the road. It is probably less than a mile. This has more shops that you can count. But be ready to walk. It isn't a mall, rather it is all outside. So from one end to the other is probably a mile and a half. It has every shop you could ever imagine. And if you want to drop off the kids it has a huge arcade named Morgan's. To see a listing of stores in Silversands and where they are located Click Here. There are other shops, but there are no other major shopping centers. Once you get to Sandestin they will be able to tell you where they are. To see more about shopping in Destin Click Here. ..everyone's favorite subject. FOOD! This is perhaps the subject in which I am the best in. First I will tell you about my favorite restaurant in all of Florida, The Red Bar and Piccolo's Restaurant. This might just be the most informal restaurant in the whole world. The atmosphere is the best part (next to the food of course). You walk in and there are candles that have made wax mountains, there are French movie posters on the ceiling and there are abstract things all over the wall. But if you plan on seeing anything you need to get there before it gets crowded. This is very difficult to do, because the place is packed by 6:00 P.M. you have to get there the second it opens. If that isn't your fancy you should go for lunch. They are never busy then. But at night if you get there after 6:00 you need to be mentally prepared to wait over 2 hours. So what about the food? Well they serve all kinds: penned chicken topped with a lemon capers sauce served w/ garlic mashed potatoes and a salad, manicotti (large hollow pasta stuffed with ricotta cheese) topped with three cheeses and a red sauce, crab cakes, pasta with shrimp and scallops (and there is lots of both), a fish of the day, among other things. Which is the best you say? Well the best thing is what sounds best to you because they are all Wonderful! And believe me it is worth the wait. Some of the other restaurants in the area are Pizza Hut, The Lighthouse, McGuire's Irish Pub, Gugliamo's, and others. If you want real Italian food Gugliamo's is the place to go. It is the most authinitc food you will get. Not to mention the best. And McGuire's is the best Irish food around. But both of these places will make a dent in your wallet. But its worth it. To see a listing of other restaurants in the Destin area Click Here. There is one major thing to do in Destin. The Big Kahoona. There you can go to the water park, go go-carting, go bungee jumping, and a couple of other things that will get your adrenalin going. To see other things to do in Destin Click Here and Click Here.